Some people just don’t “get” thrift stores. Okay, so you’ve got Macklemore (or however you spell his name) rappin’ about how cool thrift diving is. And it’s generally accepted! In fact, when you thrift dive nowadays, you get extra “cool” points. But even though it’s considered hip and trendy now to buy other people’s used junk and then rock it, some people are still clueless. And some can be downright MEAN. And I’m sure if you’re as thrift store obsessed as me, you’ve come across that ONE jerk who says the most insulting things to you about thrift stores. When that happens, shock them. Give them something to REALLY talk about! Hell, have a little fun with it! COME BACK #8: Immediately insert scratching of various body parts here. “No I’m not. I heard that bed bugs can’t survive on anything but mattresses.” Insert imaginary picking of little bugs off your shoulder and flick at the offending jerk. Now You’re Armed and Ready…. 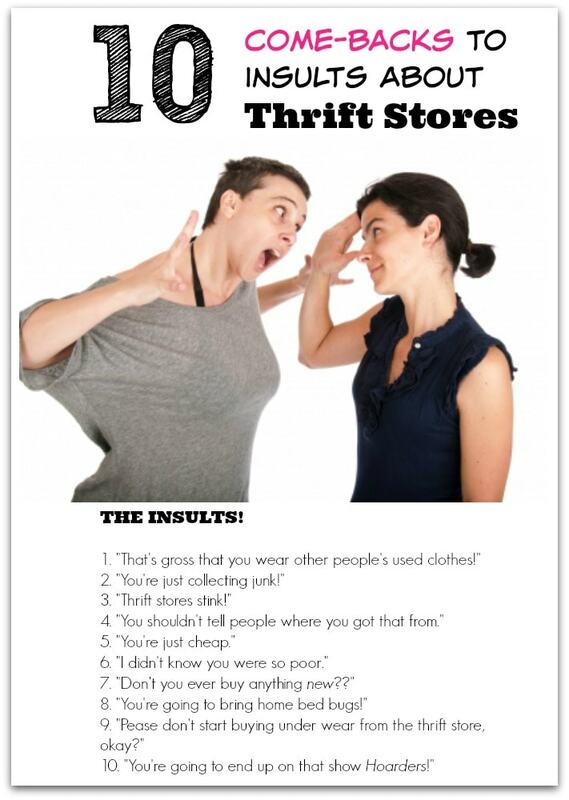 I’m curious to know what sorts of ignorant comments you’ve received about thrift stores and how you’ve responded to them. Leave a comment below to add to the discussion! I get complaints from my husband and stepson a lot about my furniture projects. I’ve never heard these before-but I guess there are people who think this way. I just feel like the furniture is special because it was loved before me, maybe not by my grandma but somebody else’s:). My thrift store furniture has allowed us to save a ton of money. These pieces are so well made they last forever and can be easily refinished or reupholstered if I want to update them. Case in point-many of my pieces were my mom’s flea market finds from 25 years ago. She reupholstered/refinished them at that time and they still are beautiful and useful to this day! Hey, Cindy! Oh wow, that’s awesome that many of your pieces of furniture belonged to your mom from HER flea market finds! I hadn’t thought about how, as parents, we’re potentially buying these great pieces that we can pass down to our kids. I’ve got 3 boys and I’d love if they kept some of the better things I have found and refinished. They’re young now, but when they’re older, how cool would that to see one of my pieces in their house. Thanks for the great insight! As for Thrift Stores? ALL IN….clothes and all. As for clothes? I go in for the well maintained high dollar…the reason being? The frugal me agrees with the above posts concerning such stores as Macys, Dillards, Belks, Nordstroms, etc. When you go in and “try” on a garment? 1- You have no idea if you are the first person who has tried it on. 2- If it doesnt fit and YOU put it back? IT. IS. NOW. USED. 3- If YOU purchase it? Were you thefirst person to try it? Is it used? Let that sink in. 4- I have purchased brand new with tags on clothes at thrift stores. 5- Funny how we lookat people and love ehat they wear buthave NO CLUE where they purchase their clothes. SUCH a crazy phenmenon to me. Yet, when I go in? Men are in there hoarding the RPL shirts..lol OR Izod…they dont care. They have no shame. One woman that I know snidely commented at church that I spent all my money on my wardrobe. Most of my church-quality dresses and skirts are from the thrift stores I frequent. I really don’t know if she believed me when I told her about that. By the way, I get complements almost every week at church. stores. I find JJill, Coldwater Creek, Talbots, Chicos, etc all the time at one of the high-end thrift shops. store ! I have 6 coats that I thrifted. Two are wool and very cozy. Three are trenches (love them) and one of them was $1 when a thrift store closed. It’s an adorable dusty pink trench. I could go on and on. I have a friend who is a germaphobe and she is thoroughly repulsed. That is OK with me, she does things that I don’t like. So what ? I shrug off the opinions of others and am not concerned about them. I love the hunt and I love the reward of a plentiful wardrobe. I don’t have to max out credit cards on clothes. her out at ReFashionista. Her name is Gillian. You are the furniture, etc diva and she is the clothing diva. I think you two should collaborate ! Too funny, Serena! Thanks for the laughs. Hi Serena, So sorry about your Grandma, even when you know it’s coming, it’s still a shock. I do for sure get a lot of my items from Thrift Stores, as to me it seems Goodwill is way over priced for the things that I am looking at, especially compared to our Thrift Store pricing. The Thrift Stores (alias “Re-Sale Shops”) actually are setup to help out the community differently. One is for women who need financial help, another one is for cats, another one is for dogs. So I love that my thrifty purchases are going directly to help. These stores have volunteers running them, which is awesome too. Goodwill helps also, but sometimes the finds in Thrift Shops just plain gets my adrenaline going for some of the cutest and unique finds that are out there!! Awesome!! What’s your comeback to a husband who doesn’t want “dead people’s clothes and things” in the house? Love this post….thanks for the comebacks, Serena. Most of my compliments about the way I look come from people who like my thrifted clothes. Lots of nice labels on my outfits!!!! Oh my Lordy. So funny. Now I hope I can remember ???? Found you via Pinterest … again! I was laughing about these insults. So.. typical. Being dirt poor after a divorce, I watch people’s jaws drop when I tell them I’ve rebuilt my house (after a fire) completely from thrift store and resuse center materials and pieces. 1) I did it, built it, stripped it, reconfigured it, painted, antiqued or stained it, sometimes SOLD it, sometimes changed my mind and gave it away, and/or just made it happen by my SELF. 3) I like it (so stuff it) and you’re just (incompetent) jealous. Love your irreverence. We could be friends! Love the toilet thing, too. Yes, we could definite be friends! So sorry to hear you had a fire, but it sounds like you turned it into a “WIN” for you in that you got to rebuilt with the stuff you like! Oh – I took it that the insulter was preposition ending. As they are wont to do. Just came back from picking up a CL credenza, and a load of Freecycle lumber that used to be a shed.